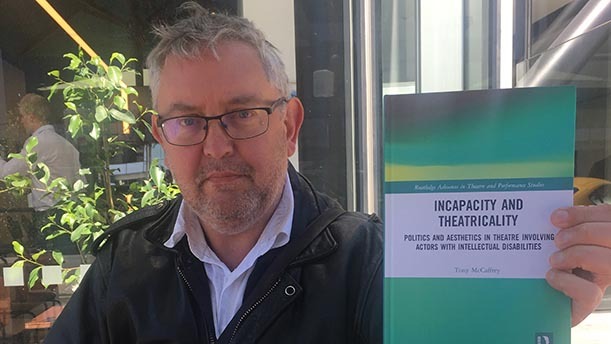 Fifteen years of work in disability performance, which has put Christchurch at the forefront of research and practice in a growing global movement, has culminated in the publication of a new book for Ara Institute theatre tutor Dr Tony McCaffrey. McCaffrey established the company A Different Light, an ensemble of performers with intellectual disabilities, in 2004 and has since contributed to an international network that is challenging assumptions about theatre, about disability and about what it means to be an inclusive society. “Writing the book was to really acknowledge the contribution that actors with intellectual disabilities are making to contemporary culture on a global basis,” McCaffrey says. McCaffrey’s book, Incapacity and Theatricality: Politics and Aesthetics in Theatre Involving Actors with Intellectual Disabilities, is published by Routledge and offers a recent history of key global theatrical performances across different media involving performers with intellectual disabilities. From the 1963 Judy Garland and Burt Lancaster film, A Child is Waiting, featuring young actors with intellectual disabilities, to McCaffrey’s own work with A Different Light, the book shows how attitudes are changing. The examples in the book show that apparent limitations can create exiting new creative possibilities. McCaffrey continues to present at global conferences, work with leading academics/practitioners and contribute to distinguished academic journals. His work shines a light on many grey areas of disability theatre, beyond simply having opportunities to perform, to leadership and agency. Who devises the work? Who runs the company? What sort of support is required? McCaffrey also contributed the chapter called Institution, care, and emancipation in contemporary theatre involving actors with intellectual disabilities in the new book The Routledge Handbook of Disability Arts, Culture and Media (edited by Bree Hadley and Donna McDonald). Original generation time 1.6384 seconds. Cache Loaded in: 0.0316 seconds.